Black Diamond Link Personal Anchor. 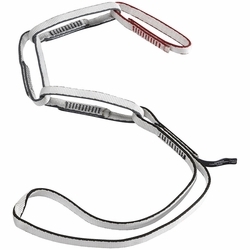 A durable personal anchor system with color-coded base and end loops for clip-in and tie-in identification, the Link provides a secure connection between you and the rock. durable and versatile connection between you and the rock, the Black Diamond Link Personal Anchor features sewn dynex loops for highly adjustable anchoring. Whether you're cleaning a sport anchor or mid-pitch on a Big Wall, the Link's adjustment loops make for a versatile and solid connection, and the burly 14mm dynex construction provides a 22-kN strength rating from any loop.